Do you suffer from neck, back or shoulder pain and you’re in need of a trusted local Osteopath to relieve you from your discomfort? Richmond osteopathy clinic is a short distance from Kew and has plenty of certified Osteos available to help you. Getting to Richmond-Osteopathic Clinic is quick and easy from Kew. If you are feeling ok to drive, Kew to Richmond is only a short 4 kilometre drive . Depending on traffic its only a 10 minute drive door to door. There is plenty of street parking that is free for 2 hours. We’ll ensure to have you in and out before you can be caught out by any traffic inspectors. 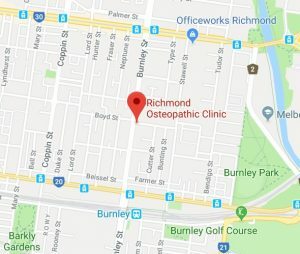 If you arrive at Richmond Osteopathic Clinic early or feel great after your osteo treatment that you wish to relax with a coffee, there are plenty of great cafes close to the Swan Street and Burnley Street corner.